In 2007 I gave birth to my daughter. In 2008 I crossed the Detroit Marathon finish line. 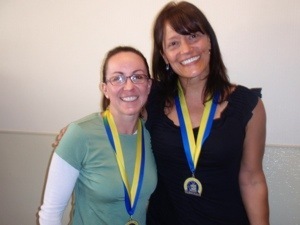 In 2009 I crossed the Boston Marathon finish line. I’m the kind of person, and the kind of runner, that wears my heart on my sleeve. So it’s more than perfect that my Groovy Girls Go is en”hearted” in a heart, and on my sleeve, for the 2014 Boston Marathon. “Me too Wilson, me too.” He and I had watched last year’s race, with the rest of my students, via the Internet. I wasn’t meant to the there. A friend had asked me to help them reach their own marathon goal and I did what I do……I said I’d run with her….and so I did. I had a Boston BQ and for the first time in 4 year, I didn’t go to Boston. I suppose, running through the worst winter in history, was only par for the course, of the toughness of character, of those going back to Boston after what happened in 2013 will all each posses. 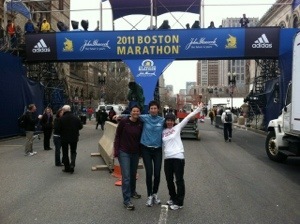 In the hight of going back to Boston, it’s hard to really understand the true meaning of what the experience will hold. I mean, its running……how important can that really be; its a hobby, what we do in our free time. Yet, If you’ve ever been a part of a marathon crowd, you know. There is just something magical about the human power of mind over body, over reasonable, over defeat, over triumph, and FOR love. And that’s why I go back. Because I LOVE. I Laugh loudly, I live BIG, I tell stories, I teach children to follow their dreams, I’m raising a daughter to try anything and everything…..don’t be afraid……and so I go back. This year I’ll even volunteer, because I’m not easily frightened. I’ve been robbed, I’ve been hurt, I’ve been violated, I’ve been left, but in the end……I will ALWAYS love…because in the end…..how much I LoVe is really all that will ever be remembered. In 2014 I’m still running……and I’m still crying. This entry was posted in Uncategorized and tagged 2014, Boston Marathon, Boston strong, Run, Running. Bookmark the permalink.